Scheduled for Thursday, October 8 , 6:30pm at Manny’s Restaurant and Lounge. This is the last scheduled Miners Park listening session. All area residents are welcome to attend and comment. The Miners Park listening sessions are conducted to discover what area residents, businesses and organizations would like the Miners Park to become. Community comments will help design the future Miners Park. Scheduled for Wednesday, September 23 , 6:30pm at Manny’s Restaurant and Lounge. Set for Thursday, October 1, 6:30pm at Rigoni’s Inn. For residents and those who work in the Industrial Park. The Miners Park listening sessions are designed to discover what area residents, businesses and organizations would like the Miners Park to become. Community comments will help design the future Miners Park. A Beautiful Day to Honor Our Miners! Added Guided Miners Memorial Heritage Park tour from 2 to 3pm. Added 2nd video to the Theatre North showing from 3:30 to 4:30pm. The “Pabst ‘H’ Disaster” video at Theatre North​ is the Radio Drama Awards Second Place Radio Play from 1986 by Ray Maurin with photos added. 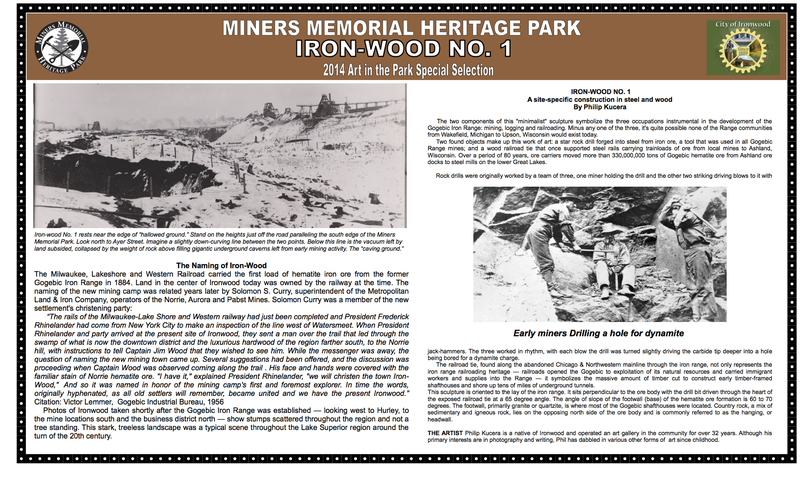 The “Ironwood – How We worked” covers the 2012 Miners Mural Dedication in Ironwood and the unveiling of Pabst ‘G’ and ‘H’ historical signs in 2013. Mining Memorial Heritage Day, Saturday, Sep 26. Ironwood’s Annual Mining Memorial Heritage Day will take place on Saturday, September 26th. Ironwood’s Annual Mining Memorial Heritage Day will take place on Saturday, September 26th on the Gogebic & Penokee Range. September 26th on the Gogebic & Penokee Range. The day’s events will include a pop-up museum at the Miners Mural downtown, open houses at the Iron County and Ironwood Depot Museums, Memorial Building Mining & Heritage Display, a video on the Pabst “H’” disaster, dinner at the Iron Nugget and a candlelight ceremony at the Pabst “H” mine site.